Aaron Barry felt his former team-mate Ryan McBride was the best defender in the league. Defender Aaron Barry believes Derry City have played their hardest game of the season. Their exciting 3-2 loss to Bray Wanderers, was their first match since the sudden death of their captain Ryan McBride. Barry, who built up a great understanding and relationship with McBride at the heart of the City defence, admitted he was totally exhausted following the five goal thriller at an emotional Maginn Park. "That's the hardest game of the season out of the way, please god," he stated. "It's not really closure because we aren't going to get closure to be honest. "As Kenny (Shiels) said we are doing it for us, because Ryan is us. We have a thing in the dressing room for the big man, but it has been just a hard few days. "As much as the game took priority there for 90 minutes, it's perspective at the end of the day, it's one football game and we have 28 or something more games in the league, so we have plenty of games to catch that back up and kick-on." The 24-year-old centre-back felt he had the 'easiest job in the league', when playing alongside McBride. "He was a joy to play with, I think I had the easiest job in the league, to be honest," he said. "I would just tell Ryan, 'go and head that', 'go there and clear that'. He was the best defender in the league in my opinion. "We have got really good defenders at the club, but no one as Ryan's kind elk. "We were two centre-halves but I was slightly different from Ryan, but I just really enjoyed playing with the big man and obviously I'm going to miss playing with him. "Between myself, Gerard (Doherty), Ryan and Jarvy (Dean Jarvis), we have been playing together for four years now. "We were looking so solid this season, but we have to adjust. We played with three at the back tonight, but we can as easily play four and everyone is fit now again. Although McBride may have been a quiet lad off the pitch, the Arklow man admitted when his former skipper spoke, everyone listened. "Ryan was a character in his own right, he was so quiet, but when he spoke, he was often very funny, but he had a presence about him," he added. "You know when someone walks into a room, everyone look up to him and that's what he was like. "The first few days after he was laid to rest, it was just crazy. "We were in training and to be fair for the hour that you are running about and training that was when we forgot about everything, but as soon as it ended we all just sat down and reminisced, talking about stuff and laughing about the good times with the big man." 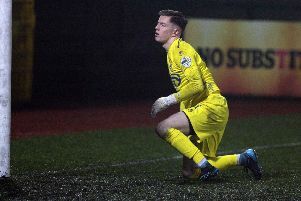 Barry was bitterly disappointed with the last minute goal, which resulted in a Bray victory, after him and his team-mates showed McBride's battling like spirit, to come from two goals down at half-time. "I'm sure he would not have been proud of the result," added the ex-Sheffield United starlet. "But the first half was just crazy. We needed to be 1-0 up after a minute, but we missed it and then it was a kind of scrappy enough first half, but we were getting all the chances and they got a little innocuous free-kick 25 yards out, he (Gary McCabe) bends it in, it was a good free-kick to be fair to the lad. "We were attacking again, were probing again, creating lots of chances and could have had two more goals, but two minutes before half-time, the ball over the top and between myself and Gerard (Doherty) we probably got to deal with that. It's a great finish as well. "When we were in at half-time Kenny (Shiels) was just saying 'look it has been a freak half, put it to bed and we need a goal every 15 minutes'. We are well capable of doing that, they had thrown away 2-0 leads before and I thought we were on our way but to be fair to Bray they dug in and to be honest I'm just excused now. "My shout to the lads as soon as we got the equaliser was go and get the winner, but I just said to Conor (McDermott) beside me 'We can't let this slip, we can't lose it now' and to be fair I don't think we lost it. "There was a couple of decisions which didn't go our way (before Bray's winning goal). I got a good header in the middle of the pitch, he decided it was a free-kick and then we had some miss communications and he scores from a few yards out, but to be honest I'm happy that's over, as it has been absolutely exhausting the last few weeks."